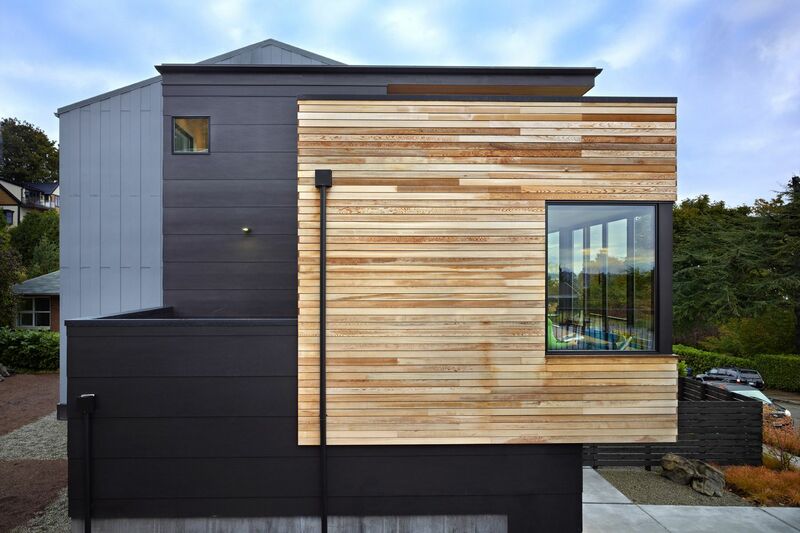 This new home was designed for a couple who found an empty lot and wanted to capitalize on lake and mountain views. All photography by Benjamin Benschneider. Constrained to a 32’ wide footprint, windows open up to the east views and light while the sides of the house allow for privacy. 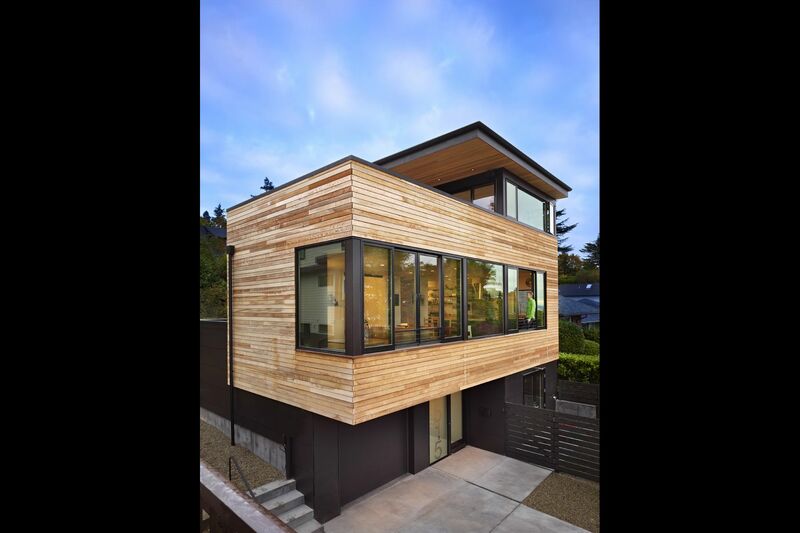 To articulate the primary masses of the residence, a combination of clear cedar siding, and cement board siding was used. A corner window at the reading bench provides a framed view of Mount Rainier. A room for storing and working on the owners’19 bicycles was provided on the ground floor. It opens to a fenced work yard. The primary volume of the house on the second floor houses the kitchen, dining, and living areas in one space that opens up to the panoramic lake and mountain views. The Kitchen is at one end a fireplace at the other. A center wall in the stairwell is clad with translucent panels. Internal LED lighting provides a soft glow to the stair through all three stories. Ebonized reclaimed doug fir treads and stringers are supported by custom steel brackets. Custom blackened steel plate clads the fireplace and reading bench in the living room. Large windows open the room up to the views. A blackened steel pipe handrail winds down the glowing wall. Bent steel plate forms a guardrail. A skylight punched through the cedar clad ceiling provides light and ventilation in the space. The master bedroom is light and airy with a wraparound window and sliders that open to a large roof deck. Clear cedar clads the ceiling. Smooth Milestone plaster surrounds this clean and open master tub and shower with his & hers shower heads. A custom stainless steel towel bar doubles as a tub access panel. The roof deck captures un-obstructed views of Mount Rainier and Lake Washington. A deep overhang provides covered outdoor space for reading and lounging outside all through the year. 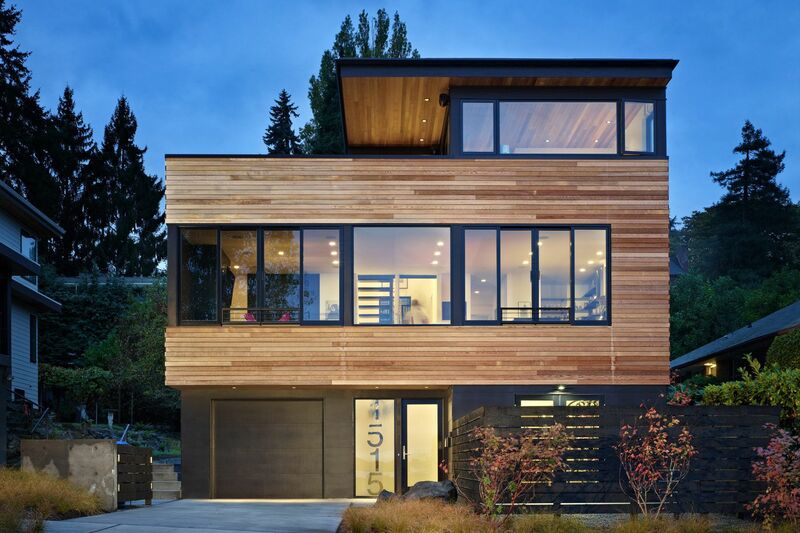 Designed for a casual lifestyle, the cycle house helps to organize the hobbies and rituals of its owners while allowing them constant connection to the exterior through views and direct access. A new house for a bicycle loving couple.